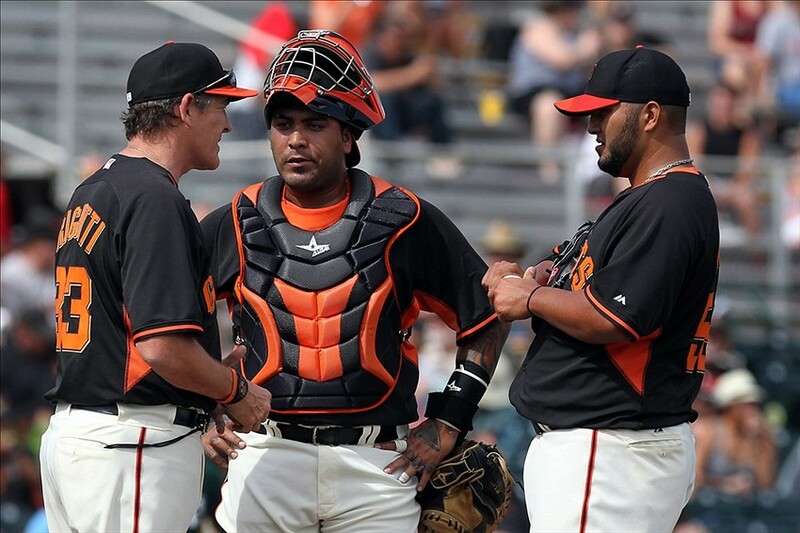 Feb 26, 2014; Scottsdale, AZ, USA; San Francisco Giants piching coach Dave Righetti visits the mound to speak with catcher Hector Sanchez (29) and pitcher Yusmeiro Petit (52) after Petit gave up four runs to the Oakland Athletics in the first inning at Scottsdale Stadium. Mandatory Credit: Lance Iversen-USA TODAY Sports. Athletics won 10-5. The Giants’ biggest weakness entering 2014 is their starting pitching depth, on the current Giants’ roster and with their minor league affiliates. If any of the Giants’ starting pitchers struggle, like a few did last season, or get injured this season, the Giants don’t have many options to replace one of their starters. Their long reliever will most likely be Yusmeiro Petit, but he has struggled with consistency with his command for his whole career. They also don’t have many major-league ready starting pitchers with the Fresno Grizzlies. Another possible weakness for the Giants is their depth. Arias, Gregor Blanco, and Hector Sanchez are all solid bench pieces. However Juan Perez (or Tyler Colvin, if he makes the team over Perez), Adrianza, and Hicks are somewhat unproven, offensively, at the major league level. It’s a little unclear how much these players will be able to contribute offensively off the bench this season, especially in pinch-hitting situations.